Please do use refined white sugar. Honey can promote dangerous fungal growth. Organic, natural, and raw sugars contain levels of iron that could be harmful. Plain white table sugar is sucrose, which, when mixed with water, very closely mimics the chemical composition of natural nectar. Hummingbirds may be some of the smallest birds in the world, but fluttering those tiny wings can be quite a workout. Flapping away at up to 90 beats per second burns up calories fast; to maintain their momentum, hummingbirds need to eat—a lot! To satisfy their speedy metabolisms, these busy birds consume half their body weight in bugs and nectar, feeding every 10-15 minutes and visiting 1,000-2,000 flowers per day. And if you don’t know which hummingbirds you have around your home, click here to learn more about Audubon Bird Guide App. 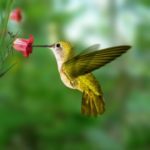 This entry was posted on Saturday, March 10th, 2018 at 10:20 pm	and is filed under Bird. You can follow any responses to this entry through the RSS 2.0 feed. Both comments and pings are currently closed.